Nursing home abuse is the mistreatment or neglect of an elderly resident in an assisted living facility. Elder abuse can be emotional, physical, and sexual. It can also involve financial exploitation. If your loved one has suffered because of neglect or abuse in a nursing home, attorney Lynn Harris and his team can provide the experienced representation needed to secure the compensation you deserve. To learn more about how we can help you file a nursing home abuse lawsuit, schedule a consultation at our Salt Lake City or Provo offices today. 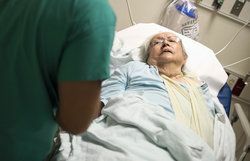 If a nursing home fails to maintain adequate security that prevents residents from placing themselves in danger by leaving the premises, or fails to prevent unauthorized individuals from entering the facility, the staff and administrators may also be liable. In addition to physical and emotional abuse, nursing home residents are sometimes subjected to financial exploitation. The most apparent indication is sudden or unusual financial transactions. Like all forms of abuse, if you suspect any financial wrongdoing, contact the authorities immediately and then seek legal representation to help ensure your family’s rights. Nursing home neglect is far too common a problem in the United States. By reporting abuse and taking legal action against negligent or abusive caregivers and administrators, we can help you secure the compensation you and your loved ones will need in order to cope with your losses. If you believe that a loved one has been subjected to nursing home abuse, contact the police. Next, contact us as soon as possible to schedule a consultation.